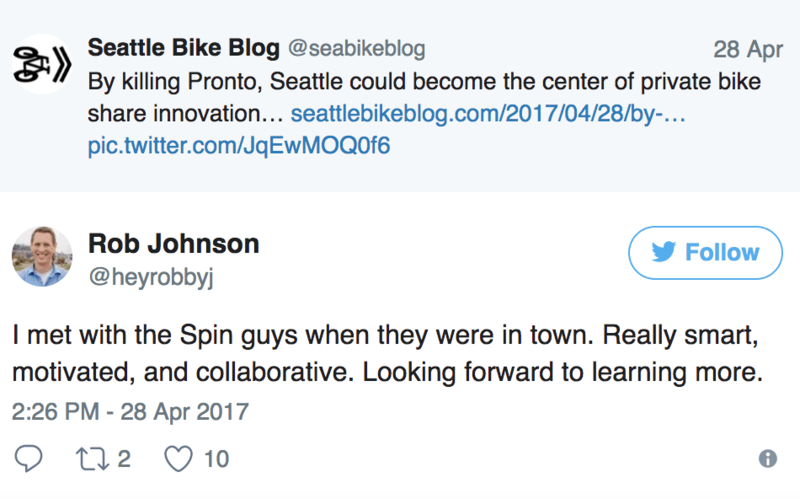 On March 31, 2017, Seattle’s bike-sharing system, Pronto, died. From its ashy, burnt-rubber-smelling remains, something new is rising. Last week the Seattle Department of Transport approved a pilot program to bring accessible public biking back to the good people of Seattle. 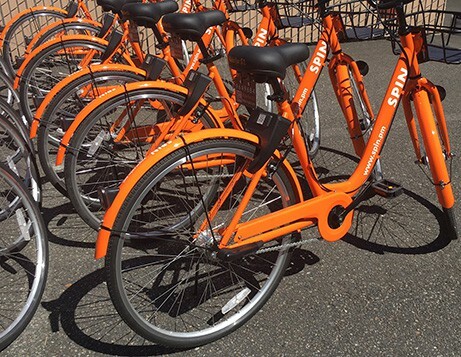 After the first weekend of this program, the phoenix here may very well be in the form of the new stationless bike-share system brought to us by San Francisco-born tech company, Spin. It isn't easy to become a city’s primary form of city-ordained biking. The City of Seattle had to reimburse Pronto users’ annual membership fees, and is still trying to find a buyer for the green and black bikes. Private spending of $2.5 million and city funding of $1.75 million couldn’t pump the tires on this program. Common deterrents were the high cost to ride ($8 for a day pass) and the distance between stations throughout the city. Seattle's abandoned bike-share program, Pronto. Spin looks to make the changes necessary to be the major player in the market. It takes a similar route as car-sharing platforms car2Go, Zipcar and ReachNow have gone in the sense that you can pick up and leave the bike anywhere, not just at predesignated stations - all for $1. With 500+ bikes currently on the road and plans to increase by the thousands, Seattle's transportation options are starting to feel a little less disjointed. This stationless concept has seen success internationally, but Seattle is the first major city to embrace it in the U.S. The founders and current team come with experience from Lyft, Uber, Airbnb and Y Combinator, and have received a significant amount of backing for their venture. Their approach? Investing in infrastructure and education. This began with a preliminary donation of $10,000 to Bike Works, a Seattle nonprofit sponsoring youth and community activity. As the bike-game heats up, Seattle has released a list of bike-share permit requirements, readying itself for the potential onslaught of interested companies following the rollout. 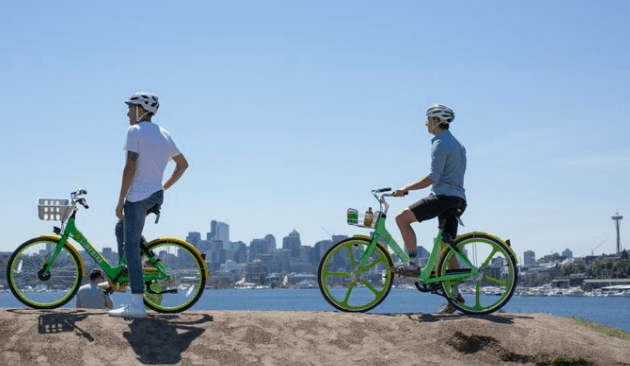 LimeBike, a similar service to Spin, has also made its Seattle debut with a more limited supply of bikes. Bluegogo, China’s biggest, and most-piled, bike-sharing company, is yet to enter the picture as they reassess their U.S. plan. They have expressed interest, but the only two to have received a green light from the city are LimeBike and Spin. America is warming up to biking as a whole and the Emerald City isn't the first metropolitan area to form partnerships with private companies. Portland’s city transportation amplified its bike service with Motivate and SoBi in 2016. Miami and San Diego work with Citi Bike. Even rural towns like Ellensburg (a hop, skip and cycle over the Cascades) are becoming more bike-friendly. These choices make sense when one looks at the National Association of City Transportation Officials report which claims that in the U.S. and Canada, 88 million bike-sharing trips have been, well, biked. 55 bike-sharing systems currently cover the nation - in 2010, that number was only 4. The global trend of bike-sharing systems as a form of last-mile transportation is colossal. Spin aims to be a "last-mile" solution, complimenting public transit. Use promo code: BARRETT for 5 free rides. As with any disruptive new service, one of the primary growing pains is with regulation and how to navigate within the confines of city rules. As Uber and Lyft have learned, there are often conflicts in municipalities for rolling on the toes of officials (see Miami's “rogue bike-sharing” snafu). They call the companies pompous and rude for not asking to set up their systems, and chastise them when they cram their hands into the cookie jar anyway. Without a go-ahead from these cities, the companies are seen as presumptuous and, in some cases, hazardous while setting up shop. Spin has been careful to make sure its service is complementary to cities' existing infrastructure. With their test-run in Austin at SXSW, the team learned how complicated the process can be when coordinating with authorities. Laura Dierenfield of the Active Transportation and Street Design division of the Austin Transportation Department said that while her she was not initially made aware of the dockless programs, she reached out to the team to coordinate. "We support bike share for residents and businesses, but it's important to do so under permits and procedures so that companies follow the city's public right-of-way laws," she said. Fascination with stationless bike-sharing systems has been a major focus. 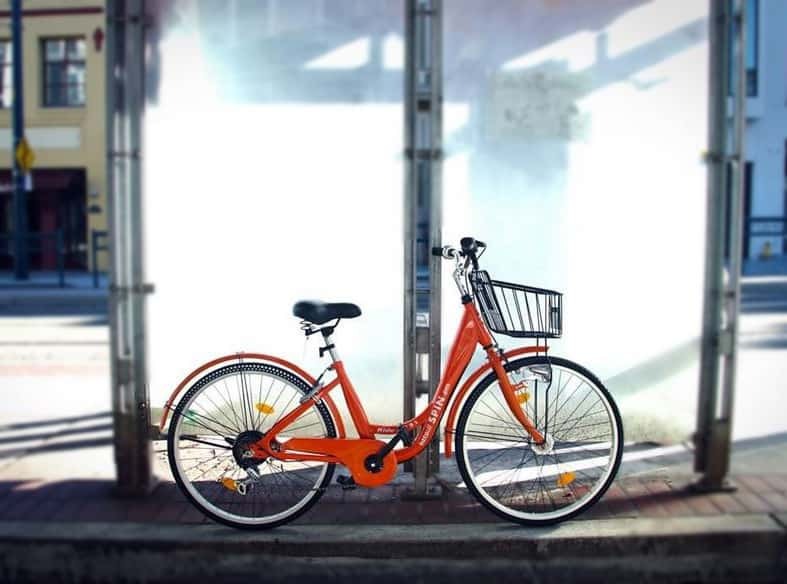 Picking up and leaving bikes wherever (responsibly) solves a few logistical issues for both riders and the companies themselves by taking costly and inconvenient stations out of the picture. By using an app-enabled GPS lock, bikes have become the newest service you can get instantly from your phone. Innovations abound, Seattle has set itself up as a petri dish for experimentation. While the market is ripe with over 158,000 bike-riding Seattleites, these companies will have to overcome the hills - both literally and figuratively. 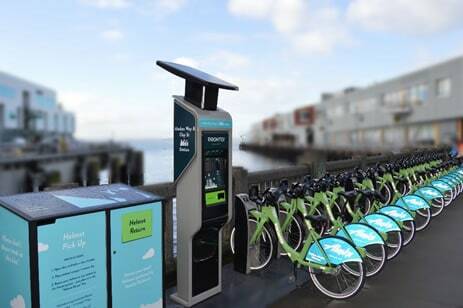 From overcoming weather and terrain to city-regulated expansion and maintenance on an ever-increasing fleet, Seattle is at a pivotal point for the future of bike-sharing. The Cascade Bicycle Club, the nation’s largest statewide bike non-profit, is looking for feedback on stationless biking. What does it mean for your community? Your commute? Your combination lock? Let them know, let us know and let prospective investors in Seattle’s future transportation landscape know. Also be sure to speak to mayoral candidates on the subject; Mayor Ed Murray is the one who gave up on Pronto, after all. Regulation on these businesses, so they compliment and do not disrupt our city, will be crucial as they evolve in the coming months. Voting on Pronto at the time, Councilmembers Lisa Herbold and Tim Burgess said the private sector could fill the gap. Now Councilmember Rob Johnson says the same. 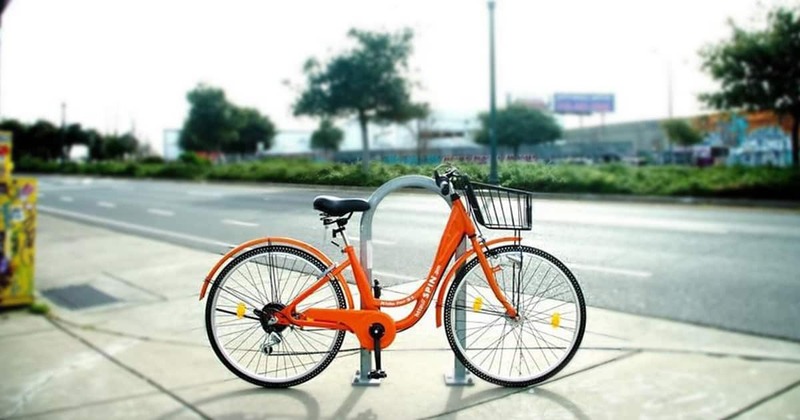 In a very near future, the Seattle landscape will be thoroughly decorated with streaks of orange and green as bike-sharing adds the missing piece to our city's transportation puzzle. Pedal on, tech-startup-phoenix, pedal on.